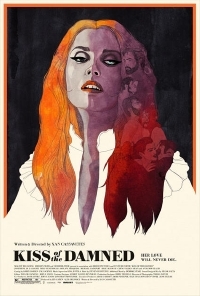 Though reviews for Xan Cassavetes' Kiss of the Damned have been far from favourable, I've been secretly hoping that perhaps the movie will deliver some bit of fun. I can't help myself: I love the idea of female vampires in control. Our very own correspondent didn't care for it but my curiosity was peaked by comments of the hammy acting and cliche dialogue. Could this be a b-movie masterpiece? Seeing the red band trailer for the movie I'm going to put my money on no. It's highly unlikely Cassavetes' movie will be memorable beyond the moment but I must admit, I do like this trailer complete with Milo Ventimiglia's stone cold line delivery accompanied by the women's bad accents and breathy dialogue. It's completely ridiculous and kind of fun with the 70's styled font and trailer music. Kiss of the Damned will be released on VOD on March 28th followed by a theatrical release on May 3rd.